If siding with AIPAC and Netanyahu means siding with Trump, a lot of American Jews may start questioning their commitment to the organization. For decades, Democrats and Republicans have touted their ties to the American Israel Public Affairs Committee, or AIPAC, as a way to showcase their support for Israel. But that may be changing. At officials and lobbyists gather in Washington today for the final day of the organization’s annual convention, Democrats running for president in 2020 are staying away. AIPAC — and Israel — will likely blame Democrats for the snub. Trump has publicly called on Jews to leave the Democrats as part of what he has referred to as a “Jexodus." But it's the president himself who is pushing Jewish people more firmly into the Democratic party, and alienating them from AIPAC. No one has done more than Trump to show that support for Israel does not necessarily mean support for American Jews. No one has done more than Trump to show that support for Israel does not necessarily mean support for American Jews. The left has been trying to break AIPAC's stranglehold on Israel policy discussions for years. The liberal group MoveOn's members are overwhelmingly opposed to AIPAC; 74 percent believe that Democratic presidential contenders should not attend this year's AIPAC policy conference. What's more surprising, though, is that many of those presidential candidates took the hint. Elizabeth Warren, Kamala Harris, Bernie Sanders, Beto O'Rourke, Peter Buttigieg, and Julian Castro are all skipping the event in 2019. But in fact, it's Trump's elevation of the worst elements of anti-Semitism and bigotry on the right that has created an opening for the left on Israel policy. Trump's approval among American Jews is dismal. Only 26 percent of them approve of his job as president, while a brutal 71 percent disapprove, according to a March Gallup poll. American Jews have good reason to distrust and dislike Trump. Republicans led a huge media firestorm over comments by Minnesota Democratic Rep. Ilhan Omar, who suggested that AIPAC was paying government officials to support Israel. That's a misleading argument that evokes anti-Semitic tropes about Jewish wealth and corruption. But Omar apologized, and later voted for a resolution condemning anti-Semitism. Her comments, while clumsy, are nowhere near as dangerous as Trump's repeated, deliberate and vile efforts to encourage the worst anti-Semitic impulses of the right. Indeed, Trump's final ad of the 2016 campaign was a blatant appeal to anti-Semtism; it showed images of Jews like billionaire George Soros and Fed Chair Janet Yellen, while darkly warning of a "global power structure" corrupting government. After the neo-Nazi rally in Charlottesville, Trump infamously suggested that some of the white supremacists rallying at the event were "very fine people." During the 2018 midterms, Trump cosigned the evidence-free, anti-Semitic conspiracy theory that George Soros might be secretly funding immigration into the U.S. The man who killed 11 people at a synagogue in Pittsburgh was inspired in part by those same George Soros conspiracy theories. Trump supporters claim that he can't be anti-Semitic because he supports the far-right government of Israeli Prime Minister Benjamin Netanyahu. As one of the first acts of his presidency, for example, Trump moved the U.S. embassy in Israel to Jerusalem, flaunting Palestinian claims to the city. Trump has also worked to undermine President Barack Obama's 2015 Iran nuclear deal, which Netanyahu sees as a threat to Israeli security. But Trump's closeness to Israel doesn't make up for his hate-mongering and anti-Semitism. On the contrary, Israel and AIPAC's support of Trump have underlined how little Netanyahu and his supporters actually care about the fate of American Jews. AIPAC, for example, refused to condemn Trump advisor Steve Bannon, despite his deep connections to the anti-Semitic cesspool of the alt right. After the Pittsburgh shooting, Jewish leaders in Pittsburgh pointed out that Trump's rhetoric encourages far right violence, putting Jewish people at risk. Israeli Minister of Diaspora Affairs Naftali Bennett, however, defended Trump. Bennett referenced Trump's Jewish son-in-law and daughter as evidence that the president couldn't possibly be anti-Semitic — which is the equivalent of saying that Trump can't be misogynist because he has been married to women. American Jews have long seen Israel as a potential place of refuge in the event of a resurgence of global fascism. But following an actual mass murder of Jewish people on American soil, the Israeli government responded by defending a man who has repeatedly spread anti-Semitic conspiracy theories. 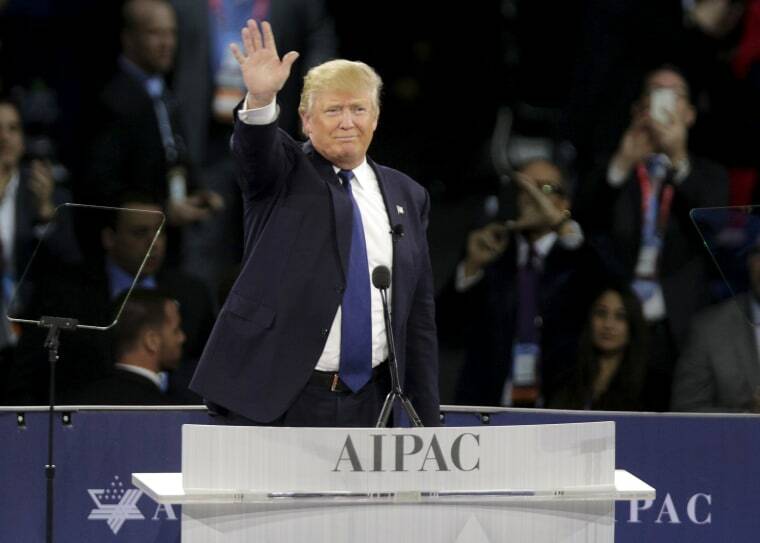 If siding with AIPAC and the Netanyahu government means siding with Trump, a lot of American Jews may start questioning their commitment to the organization. It's not just Jewish people who find Trump's bigotry disturbing, either. Israel has had broad support among Democrats in part because it has long been seen as a symbol of resistance to Hitler's genocidal program of hatred. But the main symbol of bigotry in the U.S. now is Trump himself, and it's hard not to notice that his worst impulses and Netanyahu's policies are disturbingly continuous. Trump's grotesque ban on Muslim's entering the U.S. parallels Netanyahu's claim that Arabs aren't really citizens of Israel. Trump used tear gas against children on the U.S. border; a Palestinian child in Gaza was killed in February after being struck on the head by an Israeli tear-gas canister. Trump has embraced far-right figures like Alex Jones, and has been lauded by white nationalists like Richard Spencer. Netanyahu is currently trying to form a coalition with a rabidly racist and homophobic party in order to secure re-election. The main symbol of bigotry in the U.S. now is Trump himself, and it's hard not to notice that his worst impulses and Netanyahu's policies are disturbingly continuous. Donald Trump is a hugely divisive figure. He speaks almost solely to his own partisans, and rarely tries to address the country as a whole. He even uses natural disasters like the hurricane in Puerto Rico as a way to insult and attack his perceived enemies. This has made him a uniquely polarizing president. And that in turn has led to a breakdown of consensus even in areas where there used to be bipartisan agreement, such as Israeli policy. AIPAC still retains a great deal of Democratic support; Senate minority leader Chuck Schumer and House speaker Nancy Pelosi attended AIPAC this year. It's also possible that in 2020, the Democratic nominee will address AIPAC, as has been a tradition in recent presidential cycles. But rank-and-file Democrats, American Jews and presidential candidates know that Trump is not a friend of justice, of peace, or of marginalized people, including Jews. His embrace of AIPAC and of Netanyahu are a reason for Democrats to question them as well. CORRECTION (March 26, 2019, 3:00 p.m. ET): An earlier version of this article misspelled the last name of the 2020 Democratic hopeful from South Bend, Indiana. He is Pete Buttigieg, not Buttileg.